Daybreak Games® announced that H1Z1: Battle Royale™, the original standalone battle royale shooter, has left Open Beta and officially launched as a free-to-play game on PlayStation®4. - Battle Pass Season 1: PS4 players can now unlock up to 30 rewards levels across 3 distinct lines (free, premium, and PS Plus). Battle Pass Season 1 premium line can be purchased for $5.49 / €5.49, while all PS Plus members will receive the PS Plus line included in membership. Level progression will carry over between lines. - Two New Weapons: The explosive RPG can be found in gold tier airdrops, and specializes in taking out vehicles. The deadly SOCOM Sniper Rifle can be found in purple tier airdrops, and offers a new tactical option for long-range gunfights. - New Vehicle: The ARV fits a full fives team and includes a hatch for a squad mate to fire out the top – making it the ultimate vehicle for squad-based gameplay. - New Launch Bundles: Players can now customize their character to the max through the new Viper Starter bundle ($4.99 USD / €4.99) or Hardline Deluxe bundle, which includes Premium Battle Pass ($34.99 USD / €34.99). Both Launch bundles are now available at a special launch discount until September 4 on the PlayStation Store. 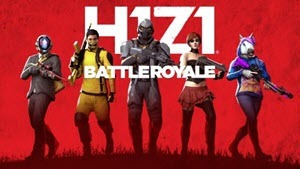 Since releasing in Open Beta, H1Z1: Battle Royale on PlayStation®4 has seen regular updates and community-requested gameplay improvements, including the addition of Revive, Airstrike Signal, EMP Grenade, Arcade Mode events, new lighting schemes, and additional tuning and balance optimizations to weapons, movement, gas ring timing, and other gameplay mechanics. Built from the ground up for the console shooter fan, H1Z1 on PS4 also features streamlined UI, inventory management, and an overhauled control scheme that emphasizes H1Z1’s trademark fast-paced, action-packed battle royale gameplay.